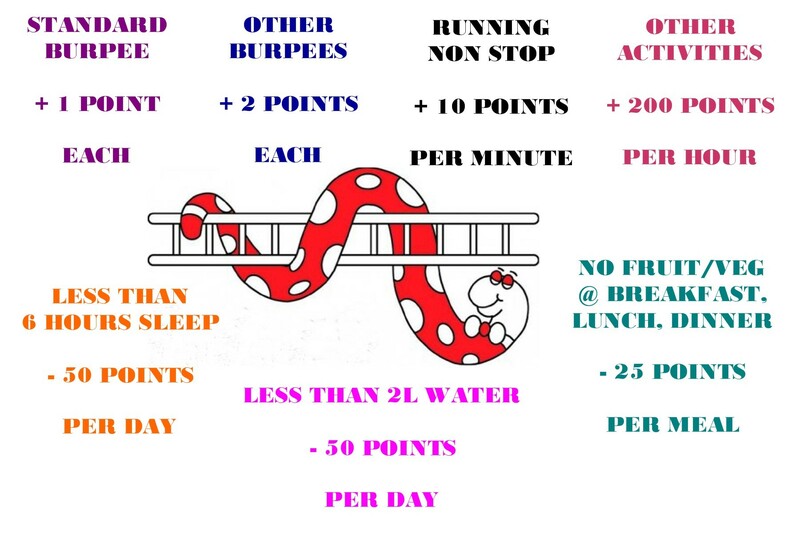 This months challenge is a game of snakes and ladders with a fitness twist! Basically you gain points for getting off your arse and moving it (yay) but you can also loose points (boo) so it’s all about the choices that you make every single day and how it’s advantageous to make more good choices than it is to make bad ones. The running must be non stop – if you run for 15 minutes then walk a bit then you can’t count the walking section in your time. As you can see you get the most points from running. This is simply because the FBs are primarily a running group training to complete the Auckland Half Marathon and these challenges are mostly designed for them. Since I’m still not doing any real running thanks to my useless knee I won’t be clocking up a load of points running so my goal total may not be as high as some of the girls who run nearly everyday and you probably won’t see me at the top of the leader board this month. My goal total is 3,500 points in week one (500 points per day) … let see how this goes! Next story I still don’t love burpees but I do love me some boobies ..